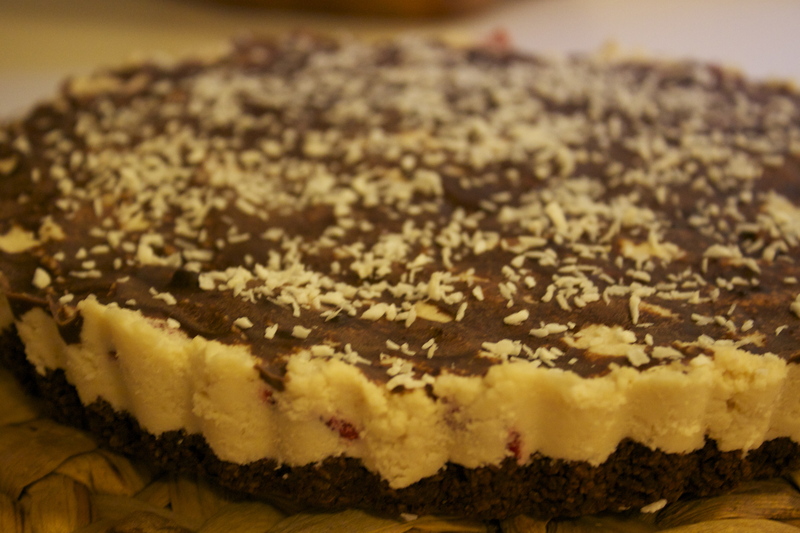 Raw Chocolate Dessert Again. It tastes as good as it looks. 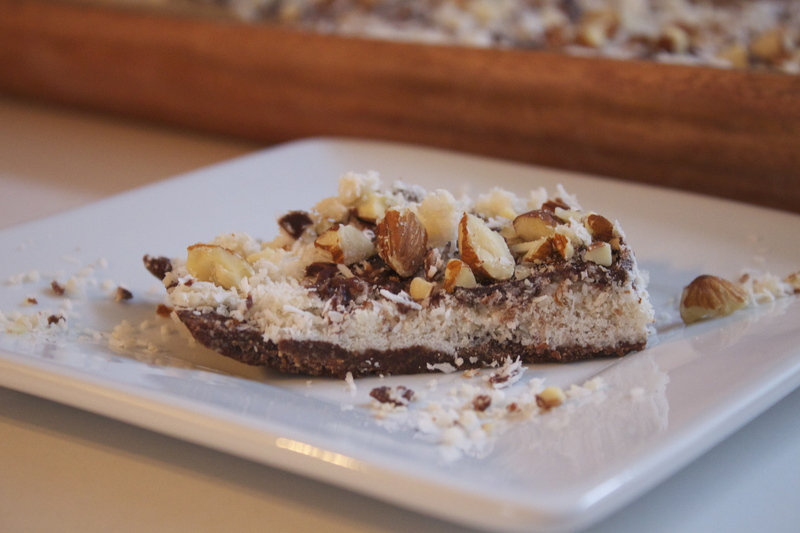 I use one special ingredient in the recipe this time: Coconut Manna. It’s that are dried, but the Manna is ground into a very fine powder right after drying. Then, they add some of their coconut oil. Manna is lower in calories than coconut oil. 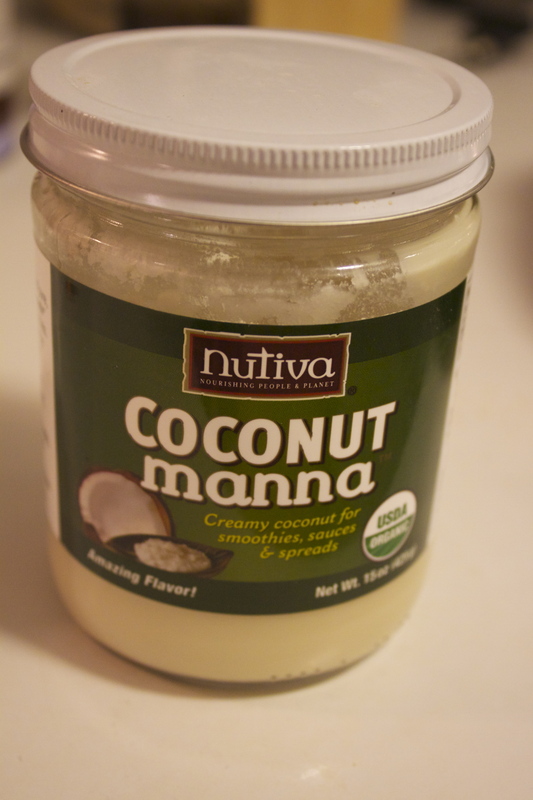 Nutiva Organic Coconut Manna contains 12% fiber and 9% protein, whereas coconut oil contains none. Run tap water to the very hottest setting, then fill a bowl and put the Manna container in the bowl for 10-15 minutes. You may need to replace the water several times to get the butter real soft. Boil water in a tea kettle and pour into a large bowl, placing the mana jar in the center. Allow it to soften.If you have a food dehydrator, open the lid of the Manna container and put it in the dehydrator on 105 degrees. After 15 minutes, stir the Manna, and then put back in for another 15 minutes, then mix well before serving. You can find it at any health food store, Amazon.com, Whole Foods. By the way, Whole Foods has it on sale most of the times. 1. Put all ingredients in the blender and mix them together. 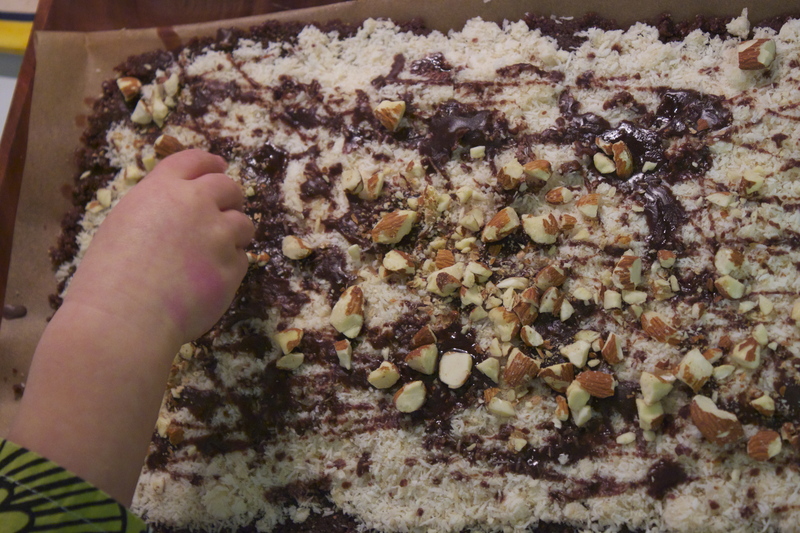 Make the first layer of the bars, pressing your almond, chocolate dough into the form. Put in refrigerator while making toping. The bottom layer should be set up (but not completely hard) before adding the next layer. 1. Place coconut in medium bowl. 2. Whisk coconut butter or manna, and agave. Pour over coconut and mix well. 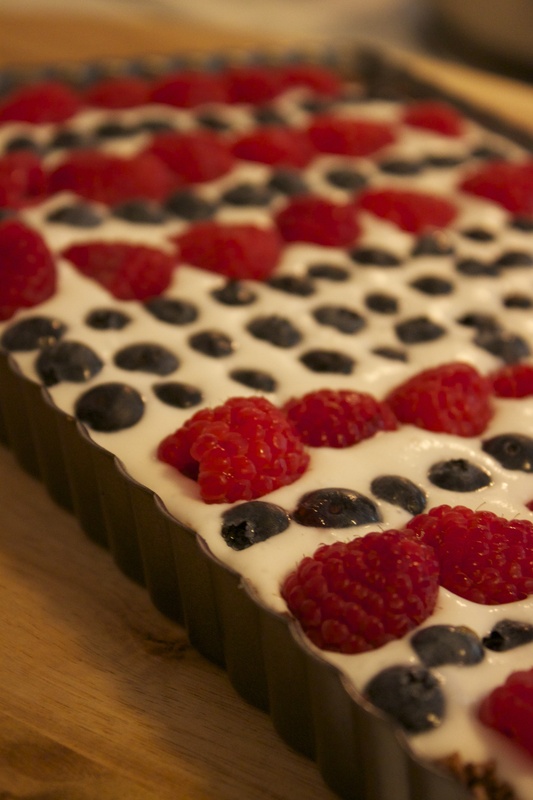 Raw Coconut Chocolate Tart with Berries. Have you ever had the moment, when somebody calls you and say they will come over for dinner tonight, and you have only 2 hours to get everything ready? Sometimes I have the moments like this, and in the past I couldn’t put myself together, I was getting nervous, I ran off time and always forgot about something. But recently, I am getting better, I learned how to handle the situation like this, how to make the delicious healthy dinner in 2 hours and make everybody happy. So 2 weeks ago was that day, when our friends called us and said they will come over for dinner. 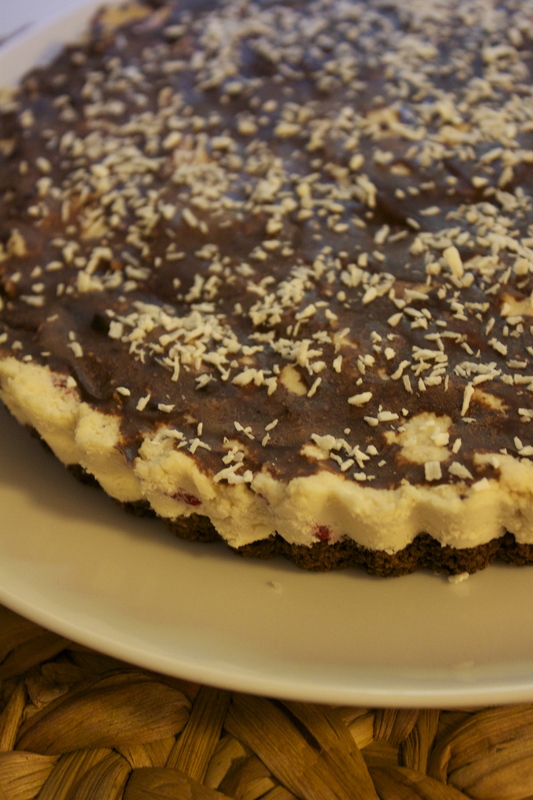 The dinner was easy to make, but I also wanted to make my own dessert, so I just checked the pantry for ingredients and made the raw coconut chocolate tart in 20 minutes. Yes, it needs some time to stay in the refrigerator, so it’s better to start from the dessert when you prepare a quick dinner. 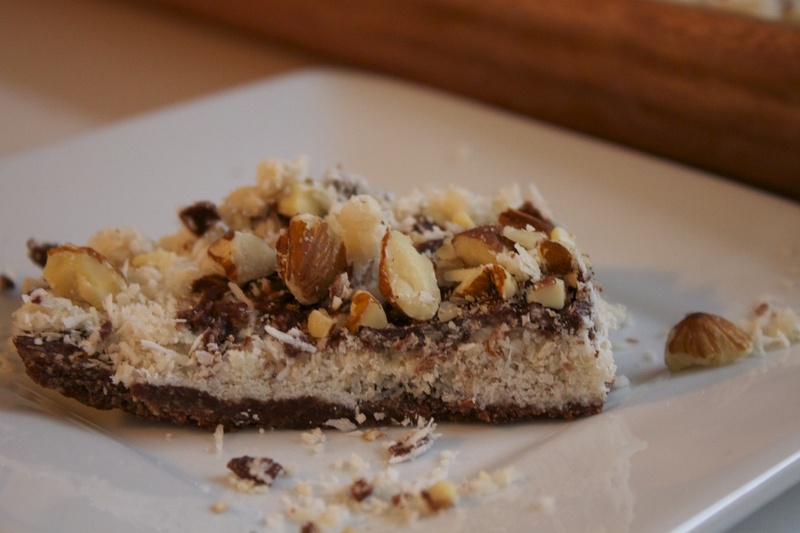 The recipe is gluten, dairy, nuts free. I would say it’s sugar free too, but I used a few drops of stevia in the whipped cream. Put all the crust ingredients in the food processor. Process just until completely combined, stop the food processor and pinch a small amount of the mixture together with your fingers, if it holds together it’s done. And if not just process slightly longer. Pour the mixture into the loaf pan and press down evenly. Put it in the freezer for 10-15 minutes. The coconut milk for whipped cream should stay in the refrigerator for a while before using it. Mix the coconut milk with vanilla and stevia with mixer on high speed for 1 minute. 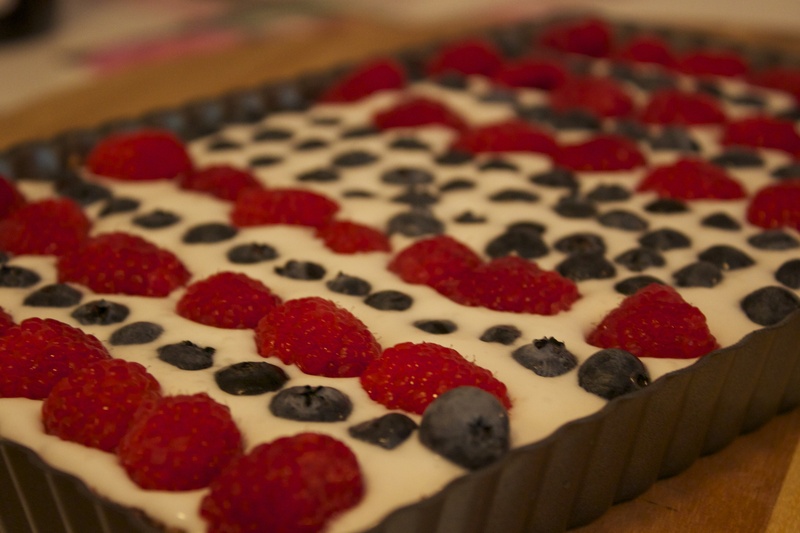 Pour the whipped cream onto the crust and put the fresh berries on top. Let it stand in the refrigerator for 2 hours before serving. 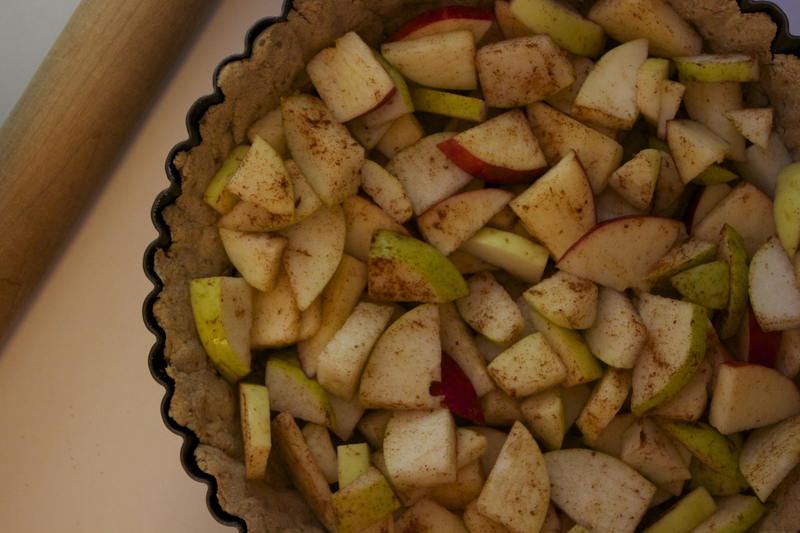 I was waiting for this moment the whole summer: to make an apple pie. Apple season started early this year, but I didn’t crave for apple pie until last week. It happened one afternoon, it was chilly outside and I just wanted to have a bite of warm cinnamon apple pie. 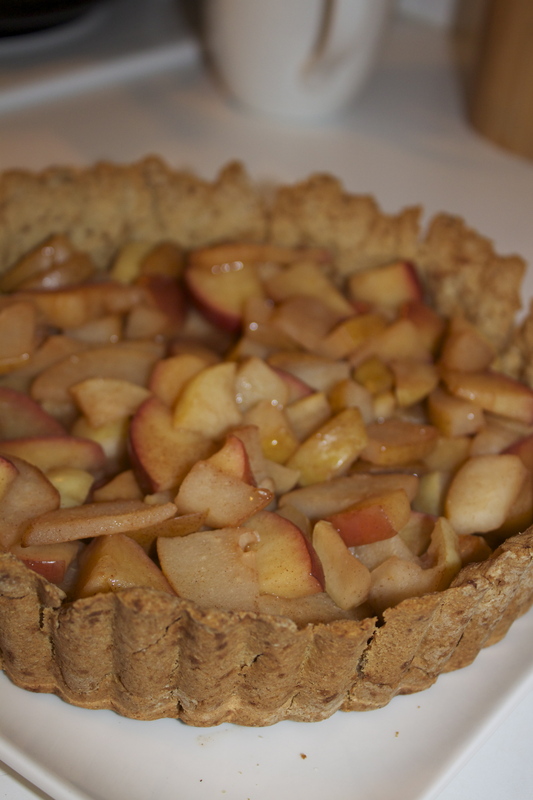 I didn’t want to make the regular apple pie, it should have been healthy version of my favorite fall dessert. So I took all the ingredients out and found out that we have only 2 apples left. I didn’t want to wait till the next day, to go and get more apples, so I used some pears in my pie too, and it worked great, and helped me not to use sugar in the filling at all. The crust turned out really good, and you couldn’t say it was made of oat and coconut flour and coconut butter. It tasted like the regular apple pie, but I knew, it was made the healthy way, and to my surprise it was finished in 1 hour. Looks like I am not the only fan of apple pies here. The recipe is gluten free. I used eggs for the crust but feel free to use the egg replacement to make the recipe completely vegan. Healthy Apple Pie ( Gluten Free). 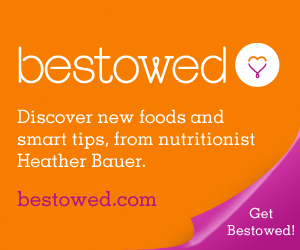 1.Combine the first 6 ingredients in a food processor. It will be pretty dry. Then start to add coconut butter until the mixture forms into a dough. Roll out the dough and place it in pie pan. 2. For the filling combine all the ingredients and simmer it on the pan on the low heat, stirring every once in a while. It should be ready in 10 minutes. 3. Preheat oven to 170C [340F]. 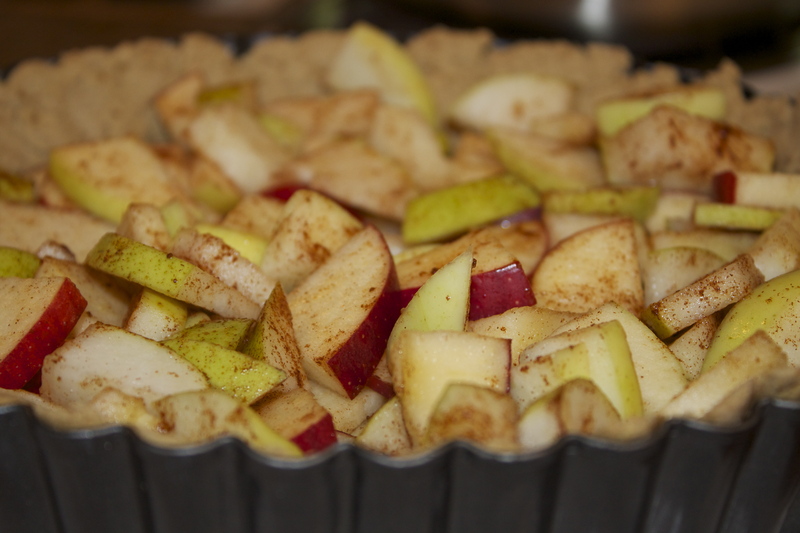 Fill the crust with apple mixture – making sure to spread fruit evenly and fill any gaps. 4. Bake for 50-60 minutes on a middle rack until golden and bubbly. 5. Let it cool for 10-15 minutes. Enjoy!!!! 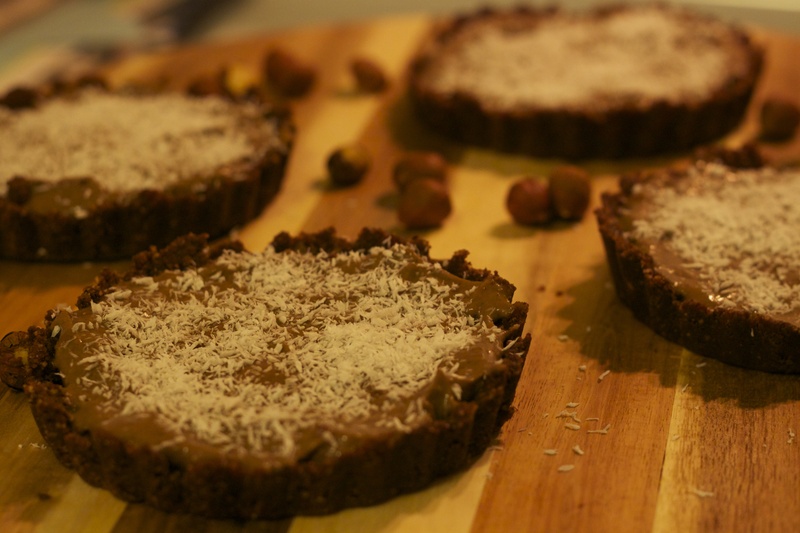 Raw Chocolate Tarts with Hazelnut Crust. Should I mention again about my deep love to chocolate? I like the smell of it, the color, the taste. Everything about chocolate makes me happy. I remember myself reading the book “Chocolate” and after that watched the movie few years ago. My dream at that time was to open the artisan chocolate candy store and experiment with making delicious chocolate candies. Dreams changed from that time, but I still like chocolate and like to make chocolate desserts and enjoy them from time to time. 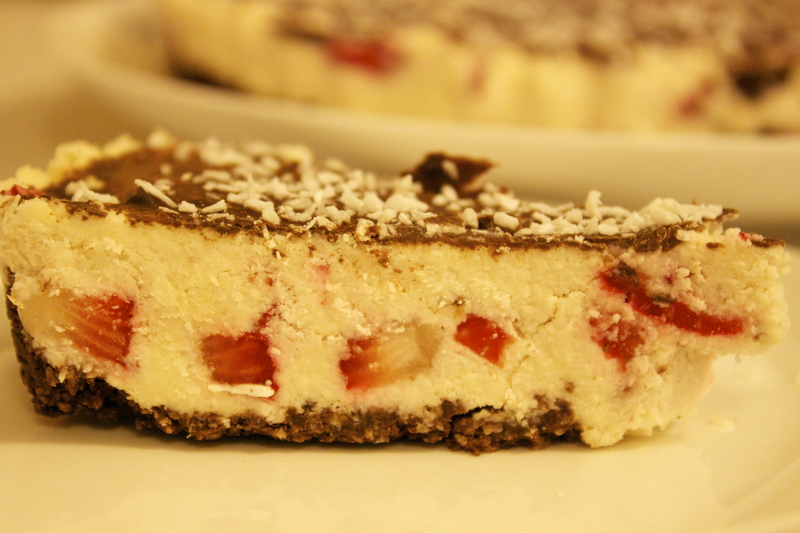 Raw healthy desserts become popular these days, and I am so into trying different raw healthy recipes now. 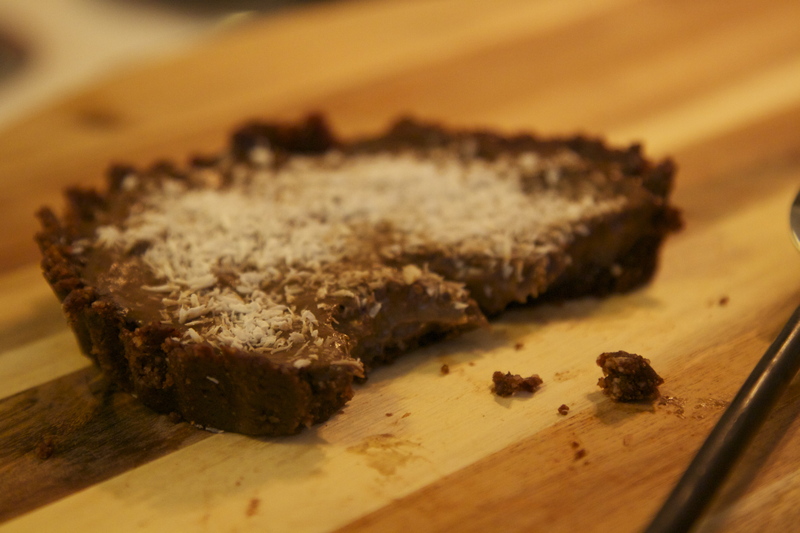 Here is the other raw healthy version of delicious chocolate melting treat. 1. Set jar of coconut oil in a bowl of hot tap water until it becomes liquid. 2. 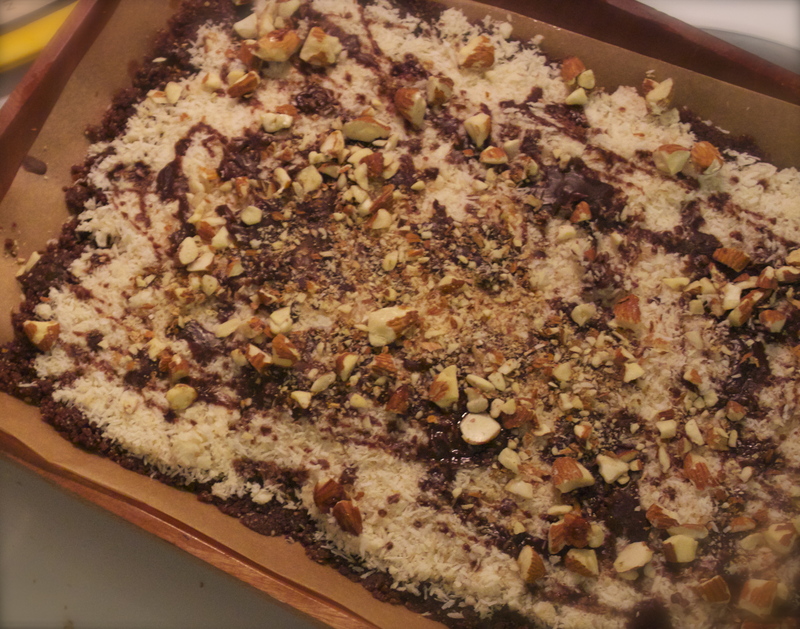 Place hazelnuts and cacao powder in a large bowl and mix well, breaking up any lumps. 3. Add coconut oil to powder mixture and mix well. 4. Place dates in a small bowl and mash with a fork. 5. Add dates to dough-like mixture and combine well with hands. 6. 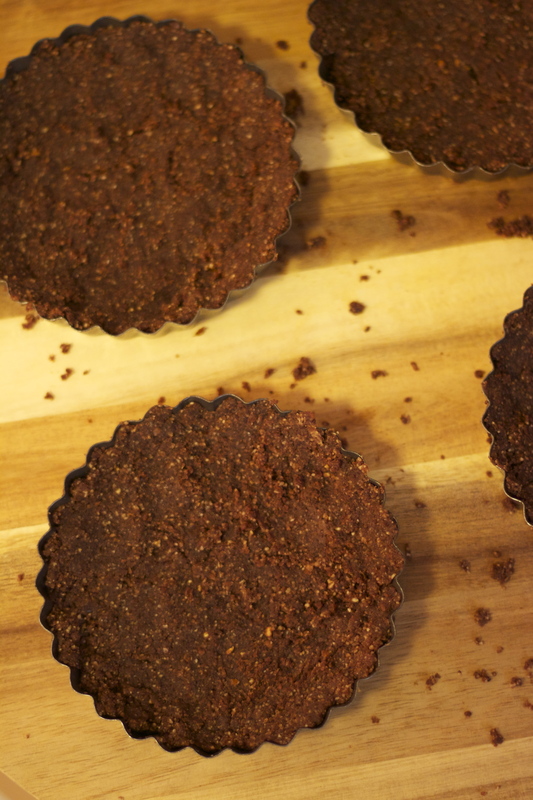 Place crust into tart pans. 7. Place crust in refrigerator while making filling. 1. Add avocado, nut milk, coconut oil and 5 dates to food processor and mix it together. 2. Once mixture is smooth, add the 5 additional dates and combine until smooth. 3. 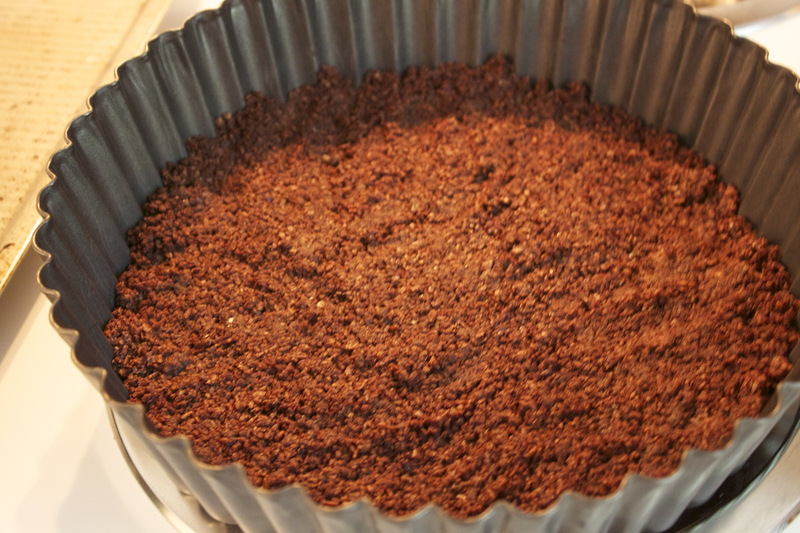 Add cacao powder and mix well until smooth. 4. Spoon filling into tart crusts. Sprinkle with coconut. 5. Place in fridge to set. Serve chilled. 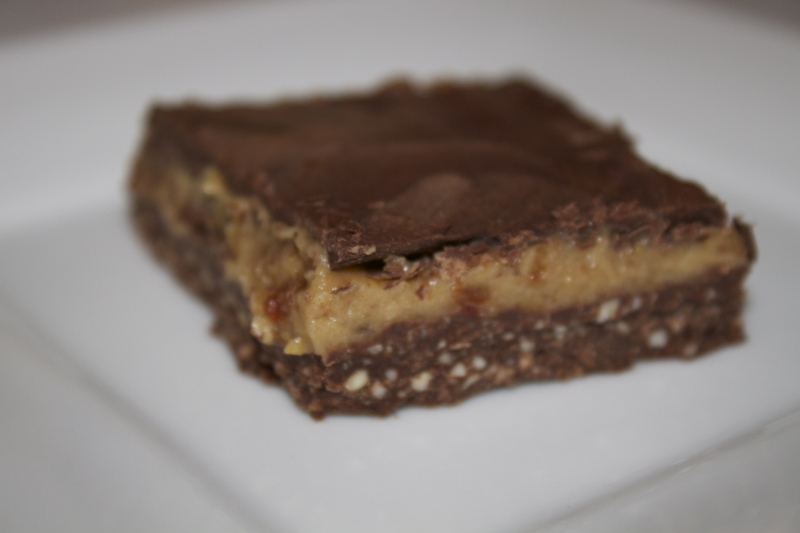 Raw Salted Almond Caramel Bars. 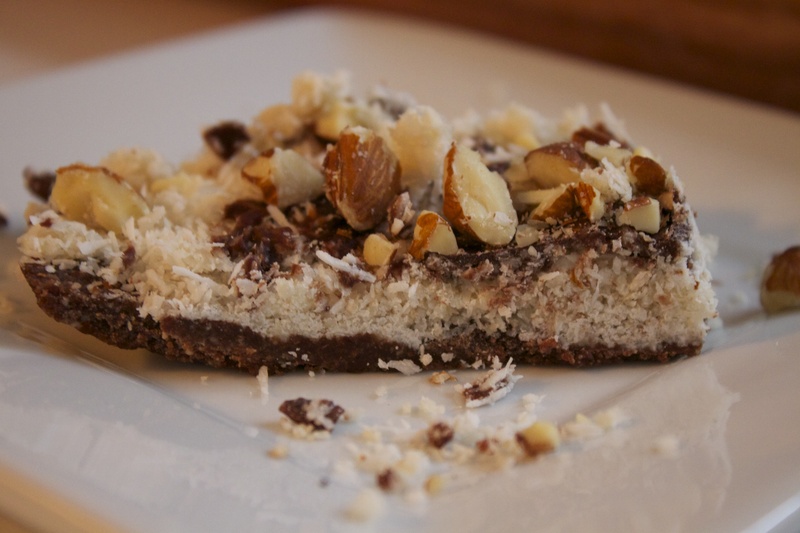 The other version of homemade chocolate healthy candies. You can call them fancy chocolate candies, because they have three layers and look like expensive chocolate candies from the artisan store. Should I say anything about the taste? Yes, they taste super good and you will remember this taste for a long time. I found out about ‘healthy’ version of caramel few weeks ago and tried it at this recipe for the first time. I am not the fan of caramel at all, but my hubby loves everything with caramel. I guess he can even eat salad mixed with caramel:) So these bars were a little surprise for him and made me happy because of the healthy version of it. Process all the ingredients in the food processor and smooth. Line a loaf pan with parchment paper and pour the mixture down. 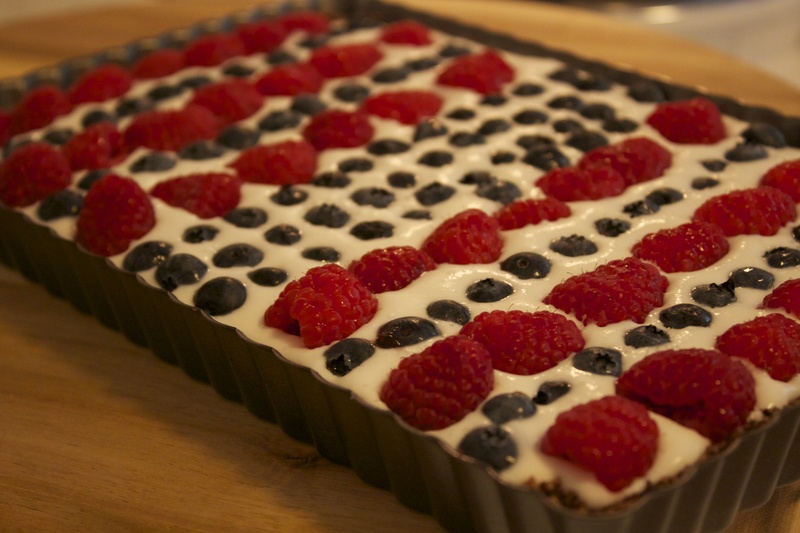 Put it in the freezer while you are making the second layer. 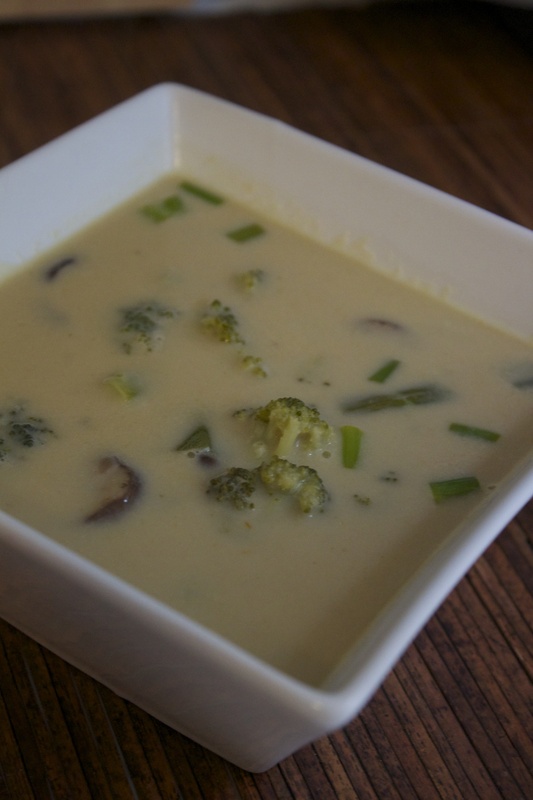 Place all the ingredients in the food processor and mix them together until creamy. Spread the caramel over top of the chocolatey base and place in the freezer for an hour. 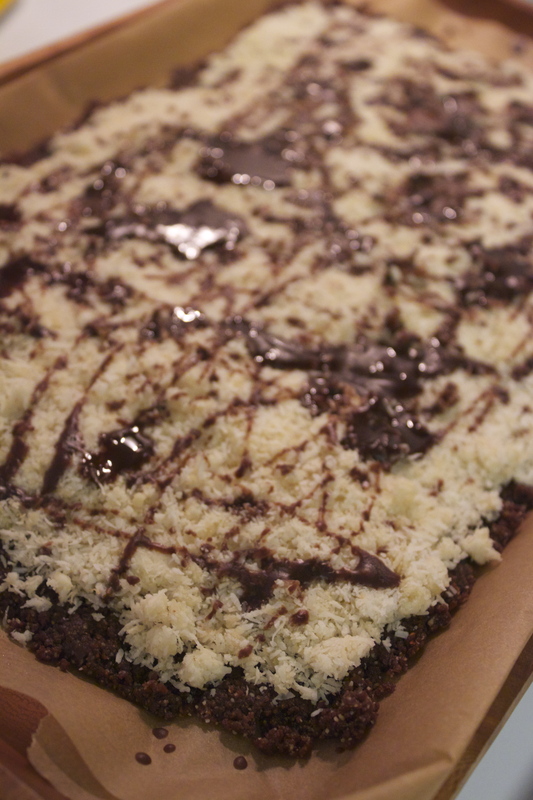 Drizzle a little bit of homemade chocolate over the top.Let the chocolate firm up and then slice them into bars or square.